Georg Schlesinger Production Engineering Award – MAL Inc.
MAL Inc. President Prof. Yusuf Altintas received the Georg Schlesinger Production Engineering award in Berlin on February 25, 2016. 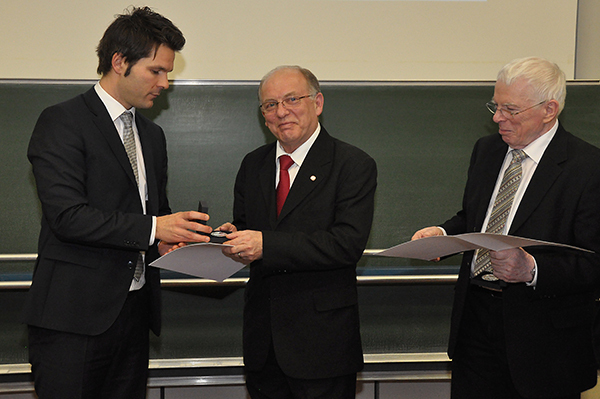 Prof. Guenther Pritschow, a CNC expert and good friend of Prof. Altintas for twenty five years, was the co-recipient of the award. Prof. Georg-Schlesinger was the leader of The Institute for Machine Tools and Factory Management (IWF) at the TU Berlin in 1920s. Schlesinger established the first scientific principles of machine tool metrology. Berlin Senate created Georg Schlesinger Award to commemorate the 75th anniversary of IWF in 1979.